Celebrations of the 100th anniversary of stainless steel's discovery culminated in a week-long series of events in the metal's birthplace, Sheffield. The highlight of the week was a well-attended conference lasting three days, bringing together hundreds of delegates from a diverse array of industries that rely on stainless steel to function. A repre­sen­tative from BS Stainless was proud to join the 230 delegates, 20 of whom had travelled from China, attending the prestigious conference. Upon arrival at The Edge, Sheffield University's conference facility, delegates were treated to the sight of small-scale models of the planned sculptures "The Kelpies"; two horse-heads formed from stainless steel. 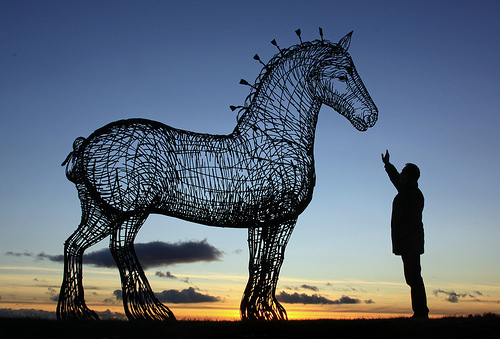 Artist Andy Scott, creator of several other critically-acclaimed, horse-based artistic works, will oversee the installation of the final sculptures on the Forth and Clyde Canal. The opening presentation of the conference was attended by all delegates and featured a keynote speech from Secretary General of the ISSF, John Rowe. Following this, The Rt Hon Michael Fallon, Secretary of State for Business and Enterprise, gave a speech before touring the exhibition and meeting senior repre­sen­ta­tives from the 28 exhibiting companies. A medal presentation by CBMM and a luxurious Champagne reception completed the first day of the conference. The second day of the conference featured many more exciting and informative presentations and debates featuring a range of industry profes­si­onals, including Director General of the Confederation of British Industry John Cridland and CEO Sheffield Forgemasters International Graham Honeyman. Drawing the largest applause of the evening was Anne Brearley, grand-niece to who is widely regarded as the father of stainless steel, Harry Brearley. To finish the conference, work tours of the Advanced Manufacturing Researching Centre and Sheffield Forgemasters were arranged. The tours were followed by lunch at the fantastic Knowledge Transfer Centre where a plaque was unveiled by Warren Brearley, marking the official naming of the KTC's Brearley Suite. It has been an exciting and memorable week for stainless steel as it reaches its 100th anniversary. BS Stainless Ltd look forward to the future of the versatile metal, which is sure to last for another hundred years and more. For more information on our range of stainless steel banding, coil, strip, stainless steel sheet, nickel alloys, stainless steel welding wire and more, please contact our skilled sales team on 01772 337555 or by email at sales@bsstainless.co.uk.